Place the orange juice, vinegar, salt, and pepper in a small bowl and whisk together. Drizzle in the oil, whisking constantly, until the dressing is emulsified. Remove and discard the stalks from the fennel and very thinly slice the bulb. Place in a large salad bowl and add the onion. Drizzle with the vinaigrette, toss to coat, set aside and marinate for at least 15 minutes or up to 1 hour. Peel the orange, removing the bitter white pith. Using a sharp knife, slice between the membranes to release the orange segments; set aside. Just before serving time, add the greens and oranges to the fennel, sprinkle with salt and pepper, and toss until the greens are well-coated. Adjust the seasonings, if necessary. Heat a large nonstick skillet over medium heat. Place one-eighth of the shredded cheese in a mound in the skillet. Cook until the bottom is browned, several minutes. Use a spatula to remove the cheese from the skillet and place on paper towel to drain. Repeat to make 8 fricos in all. 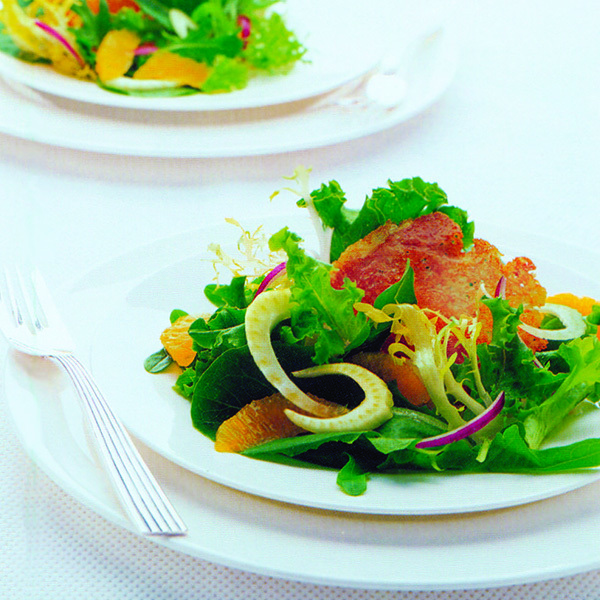 To serve, divide the salad among 4 salad plates and top each with 2 fricos. Serve immediately.